Amazon does a good job giving a brief synopsis of the book. 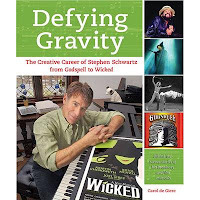 Defying Gravity takes readers into the creative world of Broadway and film composer Stephen Schwartz, from writing Godspell's score at age 23 through the making of the megahit Wicked. For this first authorized biography, Carol de Giere draws from 80 hours of interviews with Schwartz and over 100 interviews with his colleagues, friends, and family. Her sympathetic yet frank narrative reveals never-before-told stories and explores both Schwartz's phenomenal hits and expensive flops. The book also includes a series of “Creativity Notes” with insights about artistic life, and more than 200 photographs and illustrations. I love musicals and Wicked is one of my favorites. I'll admit that I quickly skipped through the first half of the book to get to the section on the making of Wicked so this review is based on the sections on Wicked. And if the other sections of the book are as good as the section on Wicked, I'll definitely be returning to read those skipped sections. When I first received Defying Gravity in the mail I began to regret agreeing to review it because well, it looks like a textbook and with the index it is over 500 pages long. But I'm glad I did because honestly while it looks like a textbook, it reads nothing like one and the word that comes to mind to describe it is fantastical. Defying Gravity takes you not only into the inner workings of Wicked but into the inner workings of how any musical is put together. There's a new TV show called Smash that does the same thing and I just think it's fascinating. Carol describes in very easy to read and understand prose the entire journey of Wicked from its conception during a trip Stephen took to Hawaii, to drafting the music and book, to casting the incredible Kristin Chenoweth and Idina Menzel as the best friends, to writing and rewriting, and finally to opening night on Broadway. I've seen Wicked five times now (including with the original cast) and know all of the music by heart so it was incredible for me to read where Stephen started with the original concept and how the team together made it into the incredible piece of art it is now. If you like Wicked or musicals in general this is a book you want to read. It's an easy but fascinating read and really gives you insight into Wicked and the musical creation process like no other book I've read. 5 stars. Want to read a copy? 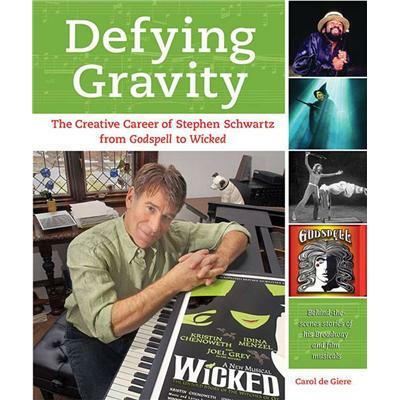 Well you're in luck because today is actually Stephen Schwartz's birthday (happy birthday!) and in celebration of his birthday, I have, not only a copy of the book, but a signed Wicked playbill to giveaway to one lucky Book Nook Club reader. All you have to do to enter is leave a comment with your favorite musical. Giveway ends Friday, March 16th. My favorite is Fiddler on the Roof! Just saw the local dinner theater's production and it was amazing! WICKED is most certainly the best! The story, the songs, the design, and the performers all make for such a spellbinding show. Everyone should see it...you won't be disappointed! I have so many favourite musicals, but since I have seen it 19 times in 3 different countries I would have to say that Wicked is indeed my ultimate fave! I love love Wicked! I read the book and seen the musical Five times last september/october when it was on tour here in Pittsburgh Pa! I was hoping to win the lottery to see it a six time but did not have any luck:) but its My all time favorite Two Witches and Love the musical the best one out there! Something for everyone and music is Ozsome! Keeps u entertained from start to finish! A must see for everyone!! I love Wicked and The Wizard of Oz!!! I do so love this show. I finally saw it when it came through town on New Year’s Eve 2010 . Love, love. love.